This annual series of lectures. which includes our faculty and staff. as well as guest lecturers, was instituted over twenty years ago by our former Head and Professor David Kaplan. They have a long and honored tradition in our Department and are an excellent example of scholarship in outreach and engagement to our University. its community and the general public. 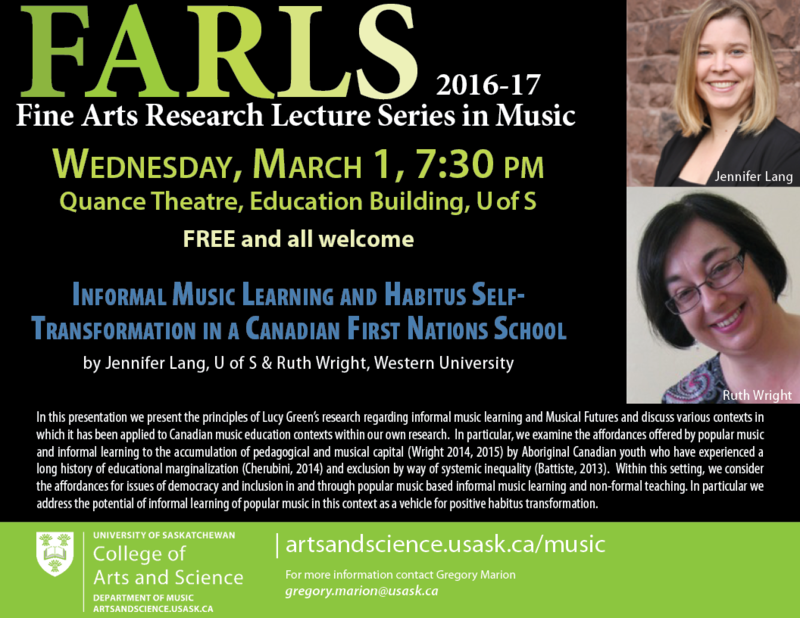 Abstract: In this presentation we present the principles of Lucy Green’s research regarding informal music learning and Musical Futures and discuss various contexts in which it has been applied to Canadian music education contexts within our own research. In particular, we examine the affordances offered by popular music and informal learning to the accumulation of pedagogical and musical capital (Wright 2014, 2015) by Aboriginal Canadian youth who have experienced a long history of educational marginalization (Cherubini, 2014) and exclusion by way of systemic inequality (Battiste, 2013). Within this setting, we consider the affordances for issues of democracy and inclusion in and through popular music based informal music learning and non-formal teaching. In particular we address the potential of informal learning of popular music in this context as a vehicle for positive habitus transformation. Abstract: David Bowser, Founder and Artistic Director of the Mozart Project, will present a discussion of Mozart’s violin music and performance style. William Boan—University of Saskatchewan music student and Saskatoon Symphony Orchestra Assistant Concertmaster—will perform excerpts from Mozart’s violin repertoire to illustrate Mozart’s approach to composition and performance. Abstract: Nomad provides a glimpse into the resilience of the Canadian Inuit people who for 1000 years have maintained a quiet dignity despite near annihilation attributable to disease and other factors. 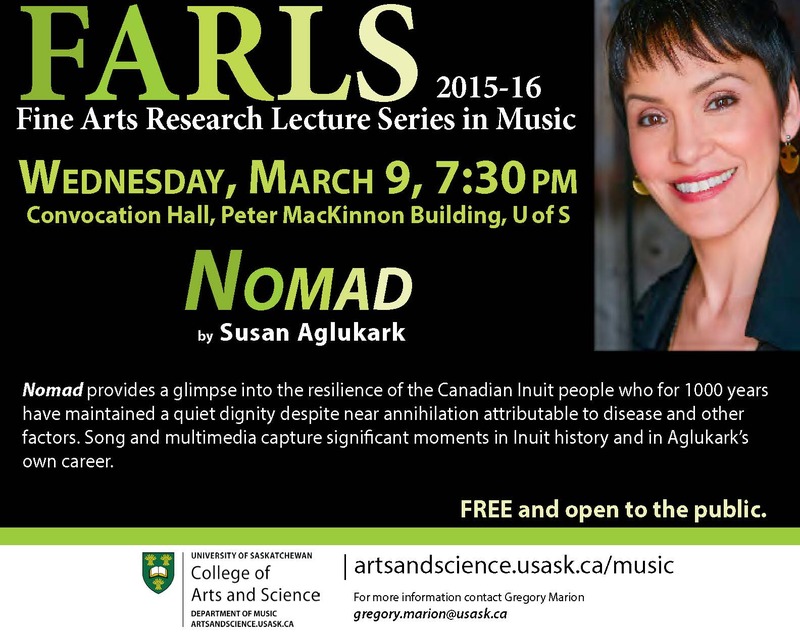 Song and multimedia capture significant moments in Inuit history and in Aglukark’s own career. 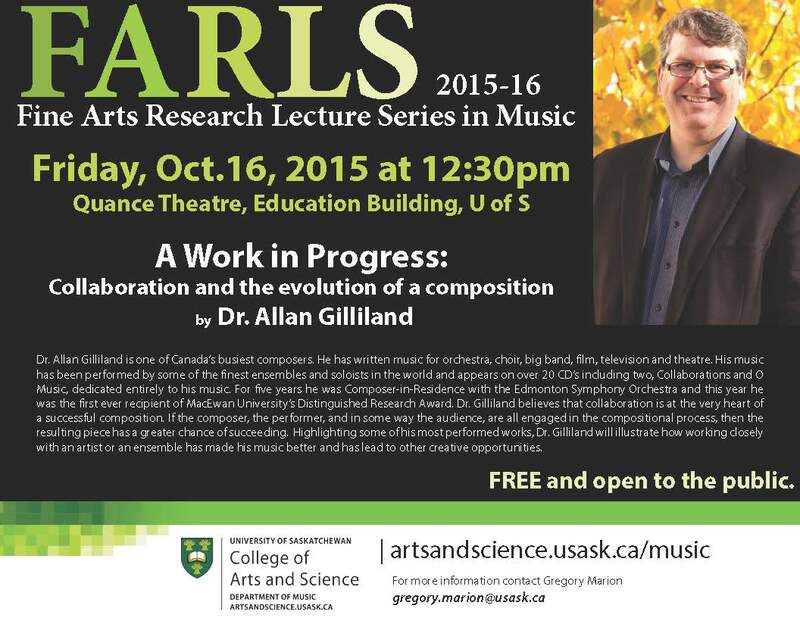 Abstract: Dr. Allan Gilliland is one of Canada’s busiest composers. He has written music for orchestra, choir, big band, film, television and theatre. His music has been performed by some of the finest ensembles and soloists in the world and appears on over 20 CD’s including two, Collaborations and O Music, dedicated entirely to his music. For five years he was Composer-in-Residence with the Edmonton Symphony Orchestra and this year he was the first ever recipient of MacEwan University’s Distinguished Research Award. Dr. Gilliland believes that collaboration is at the very heart of a successful composition. If the composer, the performer, and in some way the audience, are all engaged in the compositional process, then the resulting piece has a greater chance of succeeding. Highlighting some of his most performed works, Dr. Gilliland will illustrate how working closely with an artist or an ensemble has made his music better and has lead to other creative opportunities. Abstract: This talk will discuss — from the music improviser’s perspective — the nature of the inner “thinker” and inner “creator”, two distinct forms of intelligence which process ideas through logic and abstraction. 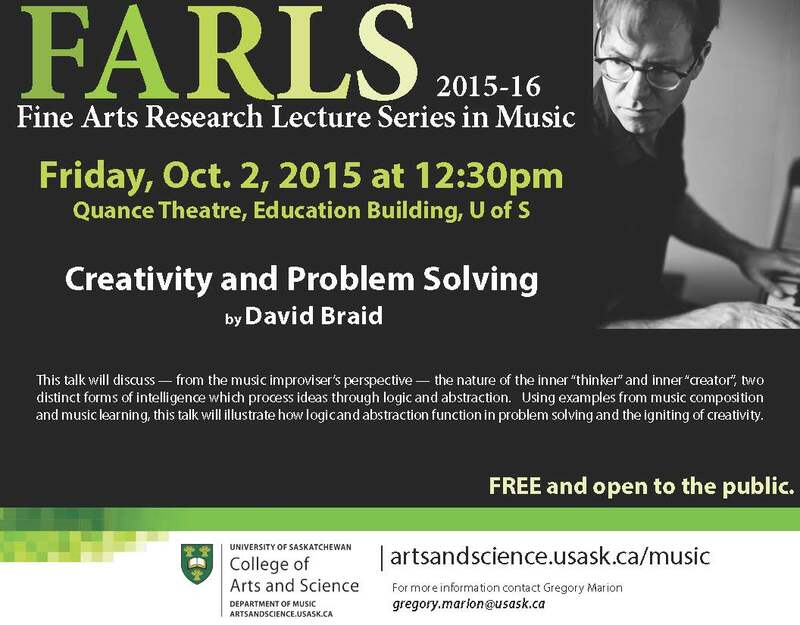 Using examples from music composition and music learning, this talk will illustrate how logic and abstraction function in problem solving and the igniting of creativity. Abstract: Performance art never stands still. Content and the medium itself continues to evolve in both predictable and unpredictable ways as we move forward through the twenty-first century. This can be both exciting and daunting to musical performers. This solo trumpet lecture-recital will present musically diverse repertoire, will include commentary on the rational behind mounting such a recital, and, thoughts and perspectives on unaccompanied brass performance practice in general terms. Prairie Fire: Large Jazz Ensemble Music of Dean McNeill and Mélange: New Music For Trumpet and Piano http://www.msrcd.com/catalog/cd/MS1294 . Dean has performed in the Western Canadian Music Awards’ Classical Showcase concert, on CBC Radio, and most recently, as guest soloist with the National Youth Band of Canada and the New Edmonton Wind Synfonia. Dean has composed and arranged music for symphony orchestra, wind ensemble, large and small brass ensembles, jazz combo, and large jazz ensemble. In the classical idiom Dean has been a member of the Saskatchewan Brass Quintet (Saskatoon, Saskatchewan), the Blue Bonnet Brass (Fort Worth, Texas), and the Red Deer (Alberta), Irving (Texas), and Saskatoon (Saskatchewan) Symphony Orchestras. He has performed as a soloist in numerous classical recitals (e.g. University of Alberta (Edmonton, Alberta), Auburn University (Auburn, Alabama), Oklahoma State University (Stillwater, Oklahoma), University of Saskatchewan (Saskatoon, Saskatchewan)), and at the 2007 Western Canadian Music Awards (Moose Jaw, Saskatchewan). In the jazz idiom Dean has performed with the Banff Centre Jazz Orchestra, Vancouver Jazz Orchestra, Birth of the Cool Repertoire Project, Art Blakey Tribute Project, Art Pepper + 11 tribute project, and with the likes of Jon Balantyne, Kenny Wheeler, Pat LaBarbera, Michael Cain, Denzal Sinclaire, P.J. Perry, Bobby Caldwell, Carol Welsman, Hugh Fraser, Tommy Banks, Bob Mintzer, Rob McConnell, Brad Turner, Campbell Ryga, Kelly Jefferson, Robert Younge, among others. Dean has led many of his own jazz combo touring projects and has performed as a featured guest artist with the Edmonton Jazz Orchestra, Winnipeg Jazz Orchestra, Washington State Jazz Ensemble 1 (Pullman, Washington), Crane School of Music Jazz Ensemble 1 (Potsdam, New York), Brandon University Jazz Ensemble 1 (Brandon, Manitoba), and the University of Manitoba Jazz Ensemble 1 (Winnipeg, Manitoba). Dean currently directs the Metro Jazz Ensemble of Saskatoon (http:// www.deanmcneill.com/music/ metrojazz.html) which has performed annually at the SaskTel Jazz Festival for the past eight years. A recipient of the University of Saskatchewan Department of Music’s Dwaine Nelson Teaching Award Dean has performed and adjudicated throughout Canada and the United States. His administrative service includes serving on the board of Jazz Canada (i.e. the Canadian chapter of the International Association of Jazz Education), Canadian Music Centre (i.e. Prairie Region Board), Saskatoon Jazz Society board, and as Head of the Department of Music at the University of Saskatchewan. Dean has been the Musical Director of the Texas Lone Star Film Awards, the Edmonton Jazz Society’s Little Bird Big Band, and the Edmonton Jazz Society’s Jazz Works music workshop. For more information on Dean’s current performance activities and published articles please visit www.deanmcneill.com. Abstract: This paper is offered on the occasion of the recent publication, by Hungaroton Records Ltd. in co-operation with MR Bartók Radio in August 2010, of my new portrait CD. This album contains two major works: The Great Initial and the Concerto for Viola and a Changing Environment (2004-2009). The talk will focus on this latter work. Assumptions about “projected” musical time are widespread but their essence rarely questioned. How is the idea of projection in musical works influenced by tradition(s), expectations (fulfilled or not). Any significant composition created today ought to address the issue in a fresh, original fashion if it is to contribute to keeping music alive. Although most major composers indeed made the issue of projection a cornerstone of their work (here brief references will be made to the work of John Cage [1912-1992], Morton Feldman [1926-1987], Karlheinz Stockhausen [1928-2007], Luigi Nono [1924-1991], Zoltán Jeney [born 1943], László Vidovszky [born 1944] and Barnabás Dukay [born 1950] and/or others), new approaches to the question are mostly absent in theoretical circles while generic theories did next to nothing to move musical analysis forward in this area. How do we process projection, how do we cope with this issue in unknown stylistic territories? How can a mosaic-like, scattered form such as that of this Concerto be considered a form at all? How is the listener expected to process and grasp it? Why is it “scattered”, yet what holds it together nonetheless? These are but a few examples of the interesting questions to be raised in this upcoming lecture. The range of educational, artistic and teaching experiences of the composer Gyula Csapó is vast and unique. Not only does he hail from the rich Hungarian tradition and cultural pedigree of such figures as György Kurtág, Péter Eötvös, Albert Simon, Zoltán Jeney and others in the Budapest New Music Studio, but beyond his Liszt Academy diploma in Composition, he turned up in Darmstadt, went to study to I.R.C.A.M. in Paris and to Morton Feldman in the United States (Ph.D., 1989). He was in contact with American composers such as John Cage, Christian Wolff; taught at universities such as S.U.N.Y. at Buffalo, McGill and Princeton University. Currently he is Professor of Composition and Music Theory at the University of Saskatchewan, Canada, but also holds a Habilitation from the Liszt Academy in Budapest where he offers courses intermittently. Csapó is the recipient of the ARTISJUS Prize for his 2009 “Composition of the Year”, the Concerto for Viola and a Changing Environment (premiered by Rivka Golani and recorded by the Hungarian Radio for this joint release with Hungaroton). Other recordings of Csapó’s music are available, such as the Budapest Music Center CD Handshake After Shot (two editions, 2000, 2002) and his A Desert March… on the Open Space label (U.S.A). Csapó is a recipient of a Fellowship from Collegium Budapest (1996-97), multiple grants from the Canada Council, the Saskatchewan Arts Board and a wide range of commissions, including those from The Burdocks (Toronto), Continuum, (Toronto), KORE Ensemble (Montréal), Ives Ensemble (Amsterdam), Rivka Golani, Trio Lignum, Arcus Temporum (Archabbey of Pannonhalma) or the Fort MacLeod Art Festival (Alberta, Canada). Csapó’s music is performed worldwide, including venues like The Juilliard School in New York, Muziekgebouw, Amsterdam, Huddersfield Contemporary Music Festival, Royal Festival Hall in London, Birmingham Conservatory (U.K.), The Music Gallery Toronto, Berlin, Frankfurt, Darmstadt, CBC Radio Montréal, The Montréal New Music Festival or the Tessara Autumn Festival in Tokyo, Japan. Concerto for Viola and a Changing Environment was nominated by the Saskatoon Composers’ Performance Society for the prestigious Grawemeyer Award in 2010. "Although the piece is challenging and demanding, I was drawn into it by its strength and magic. Working with the orchestra was inspiring and I was happy to know that there was an acknowledgment of the high quality of this creation by awarding the composer the Artisjus Price for this work. I hope that this musical experience will be shared with people worldwide."